How to write a prize poem? “There is no formula for winning,” says the award-winning poet who will soon be judging the Autumn Voices Over 70 Poetry Competition. Anne Clarke, a Glasgow-based poet whose author name is AC Clarke, clearly does know how to win. Woman Made of Glass (reproduced in full below) is a prize-winning poem which received the 2011 Grey Hen Award, a competition for women over 60. It adds to her list of awards – others include the Royal Literary Fund Mentoring Scheme (2005), the Petra Kenney Award (2005) and the Brownsbank International Poetry Competition ( 2007) – and the poem catches the eye with a sometimes startling clarity of words and images. “The best poems will take you by surprise every time.” writes AC Clarke in her advice to entrants for the Autumn Voices competition (entries are to be in by 30 July). Elsewhere she acknowledges her own personal fascination with the human body and human psyche. There’s human connection too. An active member of Scottish Pen, AC Clarke has worked with refugees and asylum seekers on translation projects. As mentor and makar (she was the ‘Makar’ for the Federation of Writers (Scotland) 2007-2008) she also stresses the importance of the meaning of words. So her advice to applicants is not just to write from the heart but to check the sense and sound of the words: read them aloud. Both Grey Hen, which was set up by Joy Howard in 2007, and Autumn Voices, launched in May 2017, set out to celebrate the creative work of older writers. He has touched a spot. The project as a whole has enthusiastic support from Lapidus, ‘writing for wellbeing’, and Luminate, Scotland’s Festival of Creative Ageing. Perhaps not surprisingly The Autumn Voices Book Launch attracted sell out crowds to events in Glasgow and Edinburgh in June this year. The book is based on twenty interviews with Scottish writers over seventy still actively writing. An impressive line up – to pick a few names (almost) at random, writers include Diana Hendry, Richard Holloway, Jenni Calder, James Kelman, Bernard MacLaverty – ensured the stockpile of copies sold out at both Blackwells and Waterstones. The poetry prize money – first prize £250, second £100, third £50 – is funded by Creative Scotland. Entries must be in by Monday 30 July. “I hope that gives your readers time to send me something,” says Robin Lloyd-Jones. “I’ll look forward to reading them,” adds the judge. For more information see Autumn Voices Over 70 Poetry Competition. So to Woman Made of Glass. Reproduced here with kind permission of the author, it is published in AC Clarke’s fourth collection In The Margin (Cinnamon Press 2015). 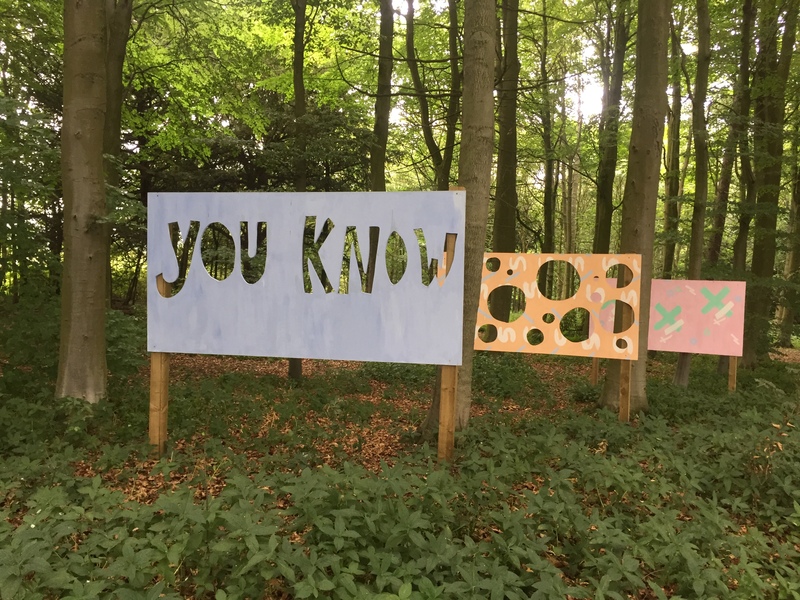 Featured Image: You Know taken by Fay Young on Woodland Walk of art workshop installations at Alnwick Castle, Northumberland.